​Sometimes in beekeeping things just don't go well. Perhaps there was a poor nectar flow or a hive just never took off due to a poor-laying queen. Or you might have a hive go queenless and decide to join it with another hive because you can't get a new queen. Combining hives can be nervewracking. Fortunately, there are methods to lessen the possibility of rejection or other problems. One hive is weak. Combining hives can be done if one hive is weak and the other is strong. If the weak hive has a queen, you'll need to dispatch her before combining. You will want to keep the stronger hive on the bottom and put the weak hive on top, using the strong hive's location. One hive is queenless. If a queen dies or goes missing you can choose to requeen, but sometimes a queen isn't available to purchase. In this case, combining the hive with another one can save it. You will use the hive that has a queen as the bottom hive and use its location, placing the queenless hive on top. Two hives are weak. Perhaps it's been a bad year and both your hives have suffered losses. As long as at least one of them has a queen, you can combine them. Or you can combine them and order a new queen and requeen the hive. If both weak hives have a queen, it's best to get rid of one before joining them. Combining weak hives may be necessary before winter if bees are light on honey stores. Each beehive needs at least 70 pounds of honey to get through the winter without starving. Make up a solution of sugar syrup to feed the bees after you combine the hives. Get a sheet of newspaper and cut three slits in it. The newspaper will allow the hives to combine without as much fighting. The slits allow pheromones and scents to be exchanged between the two hives. The bees are able to chew through the newspaper, and by the time they do, the bees will have gotten used to each other and will be integrated without fighting. Light your smoker—you will want to smoke the hives well. Grab some blocks of wood or cement to place in front of the hive. Once you have all your materials ready, follow these steps in order to safely and effectively combine two hives. Smoke and open the smaller hive. If the hive is in two deep boxes and can be consolidated to one, this is the best route to follow. Take frames of bees, brood, and honey and exchange them for empty frames in the lower deep hive body. If both deep boxes are completely full or close to it, leave both boxes intact. Repeat this process with the larger hive, consolidating it into one deep box if possible. You should have a maximum of three deep boxes to combine; more than this and there should be no reason to combine hives. Place the inner and outer covers near the entrance to the stronger hive so the bees can find their way into it. Place the sheet of newspaper on top of the stronger hive. If it's windy, you might want to tape the sides to the outside of the box so it doesn't blow off. Move the weaker hive's box to the new hive, setting it on top of the stronger hive gently. Remember to smoke everyone heavily so that they are a bit calmer during this stressful transition. If there are any extra frames or boxes that just have a few bees (no brood or honey) in them, place them on the blocks in front of the new hive so that the bees can walk into it. Cover up the top of the combined hive. Place the feeder on top of the combined hive. Leave everything alone for about a week. After a week, check the hive to make sure the newspaper has been chewed through and that the hives have successfully combined. Make sure there are eggs. 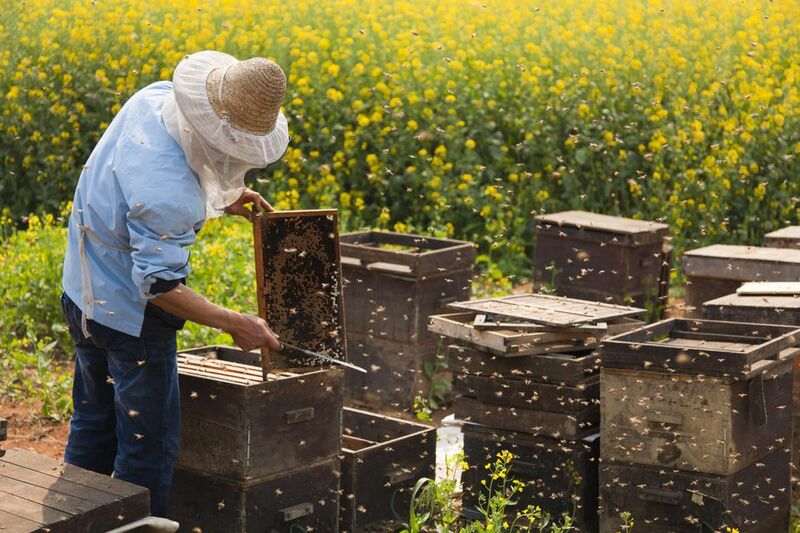 Which Type of Beehive Is Right for You? Can You Really Buy the Best Beekeeping Supplies Without Leaving Home?